Christian Binger takes a throw from Xenia Scouts third baseman Kyle Carnahan, as outfielder Jonathan Bravo backs up the play, during Friday’s first game of a Great Lakes Summer Collegiate League baseball game at Xenia’s Grady’s Field on the Athletes in Action sports complex. Binger turned the force play at second, but couldn’t throw out the Grand Lake base runner at first. Xenia won the first game, 5-1. XENIA — A good dose of hustle can turn an ordinary play into something extraordinary. That was the case in Friday’s opening game of the Xenia Scouts’ doubleheader with the Grand Lake Mariners, at the Athlete In Action sports complex’s Grady’s Field. 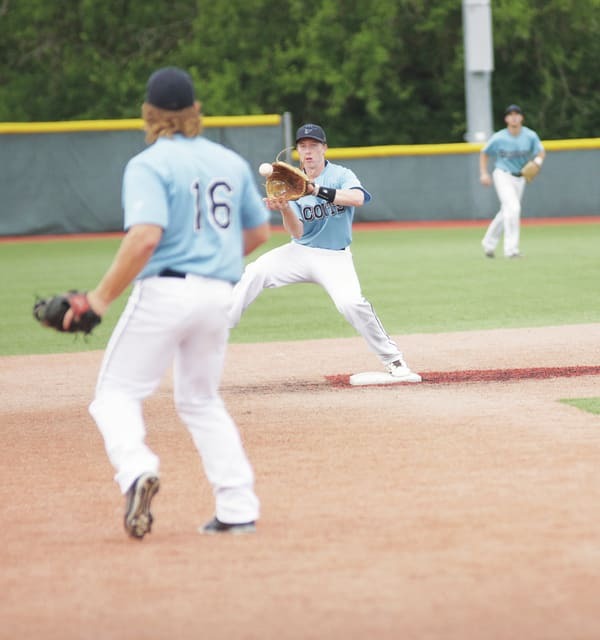 Those moments of hustle on the base paths helped the Scouts (10-4) become the first Great Lakes Summer Collegiate League team to win 10 games this season, with a 5-1 win in the opener. In a scoreless game in the bottom of the third inning, number nine batter Miles Wright came to the plate and dropped a slow rolling single into centerfield. The Mariners outfielder jogged after the ball, and that was all the edge Wright needed. The Austin, Texan from St. Edwards University kept his momentum going, rounded first and easily beat the throw into second for a double, on what appeared to be just an ordinary bloop single. Lead-off batter Lee Solomon then singled to advance Wright to third, and then Wright cruised home on an infield fielding error by the Grand Lake first baseman to put the Scouts ahead 1-0. “Miles took a chance and made a great hustling play, and it gave us the lead. It just gives your team energy when you see guys play like that,” Xenia Scouts skipper Victor “Bubba” Cates said between games. After the Scouts went down in order in the fourth, that hustling energy picked up again in the fifth. Cale Giddings started the inning by hustling down to first for an infield single. Cates put in pitcher Joey Leavitt as a pinch runner, and Leavitt was able to advance on to third on Wright’s sacrifice bunt. Solomon then reached on a single to deep shortstop. He and Leavitt then moved up a base on a passed ball, then Christian Binger singled to right field to set up another extraordinary Scouts moment. This time, Leavitt cruised home on Binger’s single but he had barely crossed the plate when Solomon came sliding in to record the second run of the inning. The play looked like the scene in the movie Major League, where the Tribe are starting to win games and there’s a shot where two Cleveland runners score almost simultaneously with Willie Mays Hayes racing in to score the second one. David Gauntt’s double to left then drove in Binger. Gauntt now has 14 runs batted in this season, currently second in the GLSCL. The Mariners’ Aaron Bence scored from third on Josh Williams’ sacrifice fly in the sixth inning to close the lead down to 4-1 in the Scouts’ favor, but Xenia’s Wright collected his second hit of the contest to drive in designated hitter Austin Orr with the team’s fifth run. Scouts starter Benjamin Aldridge is used to pitching as a relief pitcher at the University of Arkansas-Monticello, but the Tupelo, Mississippi senior limited Grand Lake to three hits in 5 1/3 innings of work. Hawaiian Joe Chasen pitched for Xenia in the sixth and held the Mariners hitless the rest of the way. And then extraordinary things start to happen. Xenia’s Levi Gilcrease hustled to triple in the second game, but Grand Lake’s Alec Turner responded with a solo home run to give the M’s (6-4) a 5-3 win. Xenia had the bases loaded in the bottom of the ninth, but failed to score. It was the Scouts’ first loss at home this season. Xenia is off today before heading towards the Cleveland area for a Sunday doubleheader against Northern Ohio. The Scouts have back-to-back home games with the Hamilton Joes on Tuesday and Wednesday before playing a weekend home-and-home series against the Galion Graders, a first-year GLSCL franchise. They’re in Galion on Saturday before hosting the Graders on Sunday. Each of the Scouts’ home contests are scheduled for a 7:05 p.m. start.